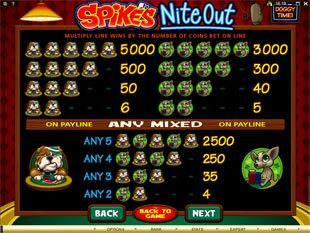 Spikes Nite Out Slots is 5 reel 15 payline dog-theme online game provided by Microgaming. This game is a great chance to remember the names of some highbred dogs as well as to win a top prize of 15,000 coins. So, our best friends are really generous! Dive deeply into the calm night full of relaxing music and entertainment for any taste. Spike’s Nite Out shows you the world of rich and gorgeous, beautiful and funny dogs playing poker, enjoying beer and cigars. 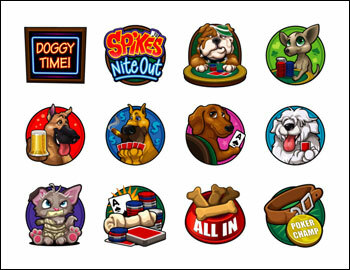 This game presents the icons of different characters and moods, so you will find a dog that you like the most. Such symbols as Doggy Time!, Spike’s Nite Out, Dog at Table, Dog with Chips, Dog with Beer, Dog with Cards, Dog with Ace, Dog with one Card, Cat, Chip and Cards, Dog Bowl, Dog Collar remind us about the 16 works of C. M. Coolidge that he created for advertising. You can choose among the following coin sizes such as $0.01, $0.02, $0.05, $0.1, $0.20. With such small start as a penny, your maximum bet can be up to 150 coins or $30. 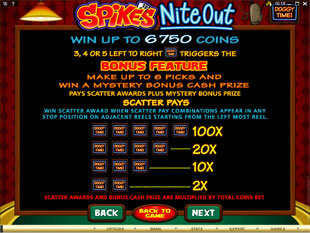 The highest jackpot is 150,000 coins or $30,000 for 5 Spike’s Nite Out. The second jackpot is 50,000 coins or $10,000 for 5 Dog at Table (Bull Dog). The third highest jackpot is 30,000 coins or $6,000 for 5 Dog with Chips (Chihuahuas). 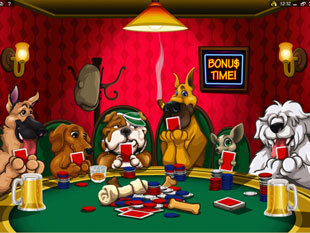 You also have a great opportunity to win 2,500 coins or $500 for any 5 mixed Dog at Table and Dog with Chips. With the maximum bet 10 coins per line you can win up to 150,000 coin jackpot. So, these dogs play really friendly and like to cooperate! The wild symbol is Spike’s Nite Out logo and it can substitute any symbol in this game including the scatter. This icon is the way to a big award of 15,000 coins, if you bet 10 coins per line the award can be up to 150,000 coins or $30,000. So try to hit it! hit 5 – multiply by 100 times! This icon also activates a bonus feature. Hit 3, 4 or 5 neon Doggy Time! symbols and activate Spike’s Nite Out Bonus Game. At this stage, you need to choose among 6 dogs playing cards at a round table. You have to choose a dog one by one till get the highest random prize that can be up to 6,750 coins. All the dogs are ready to help you, so you can reach the biggest win with 6 picks. 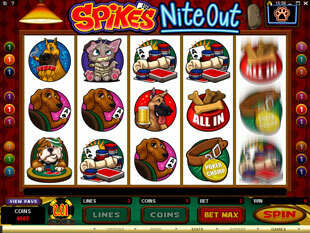 Spikes Nite Out slot machine is a game for those who like dogs and good winnings. With the top jackpot up to 15,000 and even 150,000 coins this video slot game is must-play in your list. Don’t forget about bonus feature which also brings you a chance to get good sum. Just enjoy!